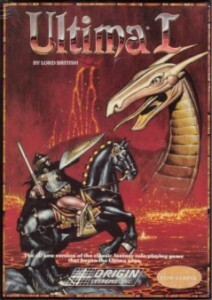 One of the early RPGs I played was Ultima Underworld, the sequel to which we’ll end up playing at some point in the future. I’m not entirely sure what led me to it. I had heard of the series before, but didn’t have much experience with it. I also played a bit with the later, entirely top down games. That was a lot more fun than my initial fears suggested. Sure, the game looks simple, and there’s clear flaws – the controls are not always the most intuitive. But unlimited lives and bits of information that carry over between deaths mean that you feel like, step by step, you get better at the game, progress further and accomplish more. The graphics are pretty simple. Mostly effective, but confusing when you’re in a first person dungeon – the corridors look the same, although a lot sort of become familiar as you keep track of your steps. The quick levelling curve and early rapid increases in power (you can often afford a better weapon and better armour after a handful of fights). The rapid wins make it fun. Even so, the game’s story is thin (although there’s supposedly space battles near the end? ), making a good effort for its time but fairly simple at the moment. The game is tantalizing in its setup. It’s simple, offer a fairly clear reward structure and hints at a story that could be interesting. Partially standard high fantasy, true, but I’m also aware of the ambition offered in later games. Even so, the difficulty is restrictive, requiring you to know carefully what you are doing. It’s easy to die early or get stuck with a character, but at least death feels cheap and easy to get past with some persistence – always armed with more knowledge as you do so.